Computer-aided versus hand-drawn. Even though I tend to live in my own little world where this battle has been fought and won, once I step outside it's like traveling back in time. The battle rages on--what should illustrators use for their presentation drawings? Pencils, markers, or should we do everything by computer? Below are two hand-rendered versions of the same drawing, one done in pencil, the other with marker. To be honest I like the look of both, but getting the pencil to look this good takes a physical toll--I felt like I was getting arthritis after I was done with this drawing. So pencil is definitely out. Color rendering by hand with Prismacolor markers. Color rendering by hand with colored pencils. I believe it is fair to differentiate between the linework and color rendering that goes into a landscape drawing. Linework by computer is by far the superior method, no question. Linework requires a measurable, precise, technical quality which is best achieved by computer. When it comes to color rendering there is more room for debate. Color rendering is a diagrammatic, stylistic endeavor which elicits a loose hand. Colored rendering by hand with Prismacolor markers. Digital color rendering using Adobe Illustrator. As for my own landscape plans, I still have not made up my mind. After creating both the digital and marker color renderings, I realized how much richer the color saturation was on on the hand-rendered version. Next time I do a color rendering by computer, I'll be a bit bolder with my colors. Hand techniques inform the digital, but in the end it will probably be computer rendering for me. As design professionals, the majority of us live having accepted the fact that we have little control over the projects we're involved in. It's somewhat tragic that a people so passionate, with an innate appreciation for beauty, and talent for creation, are forced to repress themselves in such a manner. Some gain solace in taking pride over the small things--a perfectly organized drawing set, the pristine linework in a detail drawing. Others take ownership over the forgotten corners of a project, tiny pockets the design lead is most likely to overlook--shelves in a janitor's closet, the upper cabinets at a kitchenette. Well, I have stumbled upon something restorative for all those tenured, repressed designers out there. It's called hand-lettering. Sound too simple? It is. Faber-castell ink pen, eraser pen, Ames lettering guide, bond and drafting tape. Hand lettering can be a surprisingly therapeutic exercise for architects, landscape architects, and interior designers. Take out your drafting tape, square a sheet of bond on your drafting desk, grab a light but steady hold of a 4H lead, and let yourself go. The alphabet and numbers at 1/8", 3/16", 1/4" spacings. How long ago was it since you drafted something with your own hands? Draw each guide, each line, with perfect precision. It is so unexpected, so thrilling, as if a forgotten part of you is waking up. Lead guides prior to inking. You may not believe it just by reading this--it's just lettering, right? But there is something powerfully simple about this exercise that can restore an illustrator's spirit. They need to incorporate en exercise such as this into the agenda for design professional's conventions, if you ask me. As for yourself, you may just have to give it a try to find out. The other day in public radio, can't recall the exact interview, I heard a scholar depicting Landscape Design as a frivolous endeavor, one that can only be pursued in places like the US, among a short list of wealthy countries. "Third-world countries do not have the luxury of graduating students in landscape design; we are in need of young professionals with knowledge in engineering and similar, more practical fields of study." Since when did it become a crime to pursue beauty? It think too often we forget that beauty in the built environment is key to functioning urban developments, the same way preventive care is key to human health. This article from The Garden magazine, illustrates the simple yet powerful healing that can come from beautiful gardens in war-stricken Afghanistan. Mohammad Kabir (age 105) posing in front of his garden at Darul Aman Palace, which translates as ‘abode of peace’; in Kabul, Afganistan. Photo credits to Lalage Snow. Amidst war and destruction, gardens provide a healing oasis of new life and continue to flourish, inspiring new beginnings even under the most unthinkable conditions. Yet for us who have spent most of our lives removed from these hardships, have we forgotten the value of such simple things? Beautiful, smart, landscapes can heal the soil, preserve native ecosystems, reduce pollution, prevent local flooding events, and perhaps more importantly, they feed new life into each of us. Many studies have shown having direct visual contact to the outdoors on a daily basis can lower absenteeism rates and improve individual worker productivity by up to 18%. Could it be a sign that we on some level still seek these seemingly unquantifiable benefits, when the majority of 'innovative' landscaping solutions are rooftop gardens, living walls, among other shoehorned retrofits? If only for a moment we could mitigate our zeal for 'efficiency', we might come to understand how sometimes a straight line is not the most direct path. In a way, gardening presents many parallels with meditation. Just as one can attempt to bring order to one's thoughts, landscape design has sought to bring order to the seemingly chaotic state of nature. Formal French gardens, such as those seen at the North entrance to the Musée de l'Armée below, are a good example of the extent of such enforcement. Geometrically trimmed specimens at Musée de l'Armé, Paris. Image by Alejandra Feliciano. If the intent was to conquer nature, I'd say we've succeeded. We have seen the extent of the power we can exert over the natural order. Here in Iowa, the entire landscape is artificial--an ocean of corn and soybean crops. This environment is just as manufactured as dense rows of skyscrapers. But were we out to conquer nature solely to display our prowess? All design is an exercise in subjective selection and is inherently unnatural. There is no doubt that in exercising the order brought by design, we continue to gain much knowledge on specimens and their relationships with ecosystems. We seek order, and in doing so we further our understanding of the world around us. Regretfully, such practice is not self-sustaining. By replacing all natural environments with designed ones, we increasingly eliminate future opportunities to further our understanding. So instead of being lead blindly by this desire to control, what role should we play? Today I'll let my mind settle over a thought for finding such balance. For those of us who call the American Midwest home, winter is a great Season to get out of the cold and travel. Alright, let's be honest--it's the only season. Once Spring hits you cannot tear me away from my beds until Frost. This winter seems to be taking no prisoners, and it's got me thinking about my travel bucket list. On this first edition of Destinations for Plant Lovers, we have the East Lambrook Manor Gardens by renowned gardening writer Margery Fish. View from the Terrace. Images by East Lambrook Manor Gardens. There is something intrinsically innocent and no-nonsense about cottage style gardens that I gravitate towards. Intending to emulate traditional gardens of the working class dating back to the 14th Century, these gardens included vegetables, herbs, and a few perennials. 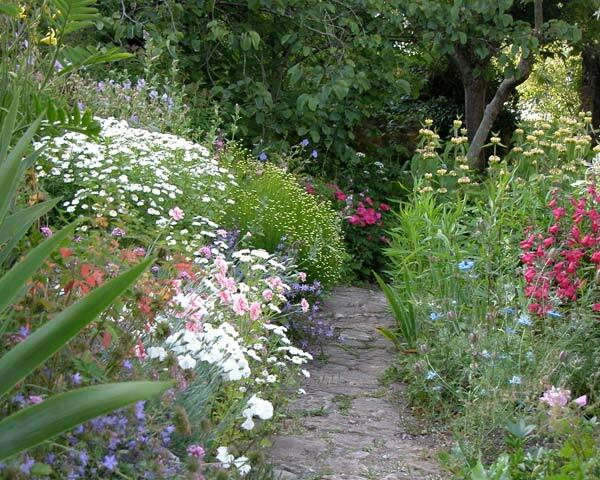 The style was propelled by the Arts & Crafts movement in the early 20th Century by Gertrude Jekyll and Lawrence Johnston among others, with more perennials and free-seeding specimens and fewer vegetable patches. Yet what Fish managed to champion through these gardens was something quite different from her contemporaries. It appears that this garden was designed on a much more intimate scale, and by doing so Fish maintained the practicality and simplicity of the working gardens of old. To me this approach set the precedent for two core principles: making gardening accessible to the layman, and releasing our tight grip on nature's hand. These lessons are relevant still today, may we rise to the challenge! Sketch by Alejandra Feliciano. Copyright 2013. All rights reserved. An outlet for ramblings? I used to doodle eye sketches as an outlet for my twitchng hand. Hopefully this will achieve a similar effect, as well as some unexpected collateral. Once, not so long ago, I had sworn off this medium--never say never! Who, knows? Perhaps there is life out there.